Femulate: Still Shocking after All These Years? Starla still makes new womanless findings in those old high school yearbooks and when she does, she sends them to me to pass on to you. Her latest finding from the 1998 Naperville (Illinois) Central High School yearbook has a story to accompany the photograph. The photo does not reveal any "exaggeration of the female anatomy," so it seems like the school principal might have thrown the exaggeration statement in just to cover his transphobia. And I wonder if what was inappropriate in 1998 is still inappropriate in 2016? I imagine your mileage may vary. 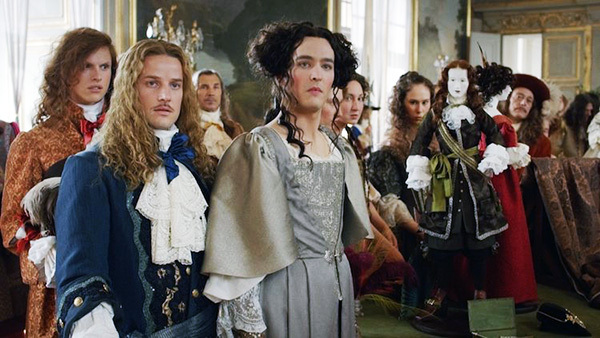 Alexander Vlahos (center) femulates in French television's Versailles. I was just in Naperville last week!!! I didn't see Kim but did get out myself. This picture was taken last year in Naperville. Looking at Kim's shaved legs, make-up, and hair, I'm guessing not a civilian!!! Kim was into it!!! I agree with Paula on Kim's presentation...everything except the shoes. I also think that today, less than 20 years later, the reaction of the school officials would be supportive rather than confrontational. I don't know - the choice of footwear tells me that Kim is a guy in a dress. Maybe with a sister or mother or female friend who really went to town with the make up. But the shoes tell me Kim is much more he than she. That is a pure femulator. If she was crossdressing as a joke, she would have thrown on one of their mom's old dresses and maybe a wig. But the dress, the legs, the makeup, the hair, the jewelry, and the NAILS...that kid went all out. I'm guessing she has large feet and couldn't find girly shoes in her size. What's more, that wasn't just a couple of friends doing something as a lark. Going out to dinner with a boy before a dance, posing at your parents' house with his arm gently around your waist...that's a date. And the romantic in me hopes it wasn't their last. Heck, maybe this photo was in the collage they displayed at their wedding reception.